Participants in the laser leveling demonstration learn the basic principles of the technology and how to operate the equipment. IRRI’s CORIGAP project supports capacity building of NARES partners and other rice-farming sectors, such as youth, to accelerate adoption of best management practices that will support Indonesia’s national goal to achieve rice self–sufficiency. The swampy land areas of South Sumatera, Palembang are poised to become the next rice granary in Indonesia. 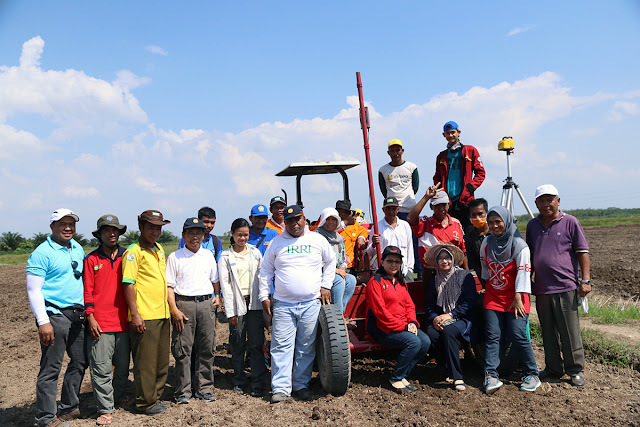 Recently, to step up the region’s agricultural productivity, local extension professionals, farmers, and students were trained on the use of laser-assisted land leveling and tractor driving in Palembang. Marto Suwarno, local owner of a 3-hectare rice-corn farm and leader of Gabungan Kelompok Tani (Association of Farmers’ Group) in Mulya Sari village, pointed out a problem that he has been experiencing on his farm. “I always have uneven plant growth in my rice and corn fields, but I hope there can be a solution,” he said. 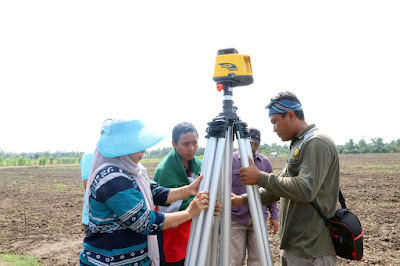 Laser leveling of the land could be that solution and it was demonstrated for the local extensionists, farmers, and students on Pak Suwarno’s farm during an event on 24-25 May. Budi Raharjo, who spearheads the Assessment Institute for Agricultural Technology (BPTP), partnered with Pak Suwarno to illustrate the benefits of the laser leveling technology. Caling Balingbing, postharvest and mechanization expert at the International Rice Research Institute (IRRI), presented the principles and advantages of laser-assisted land leveling and answered queries on issues related to timing and soil type. He also guided BPTP staff members on properly doing automatic land leveling on Pak Suwarno’s fields. The students were able to actually drive a tractor with a disc-plow attachment, which is another land preparation implement. “I enjoyed driving the tractor for the first time and found it is easy to use,” said Hanip Nurdiansyah, a 20-year old student from the University of Sriwijaya. “We don’t usually see tractors and big machines, so it was a happy experience to handle such equipment that can improve land productivity.” Another student, Alkahim, felt that the hands-on experience enabled him to appreciate his agricultural education even more. “I am an animal science major and experiencing this for the first time has expanded my horizons that there are more things to do in agriculture,” he said. The event was organized by BPTP South Sumatra, in collaboration with ICRR in Sukamandi, the Indonesian Center for Agricultural Engineering Research and Development (ICAERD) in Serpong, and IRRI through the CORIGAP project. Other participants were Syngenta Jakarta and students from SMKN Tanjung Lago and University of Sriwijaya in Palembang. The BPTP South Sumatra staff members, who were earlier trained on laser leveling by the IRRI-CORIGAP project last September 2016, also trained the students on how to conduct a topographic survey. The CORIGAP project is funded by the Swiss Agency for Development and Cooperation.